The Great Karoo comprises the hidden heart of South Africa, sprawling across 150,000 square miles of the country’s interior. It’s a vast landscape of open range, high rocky escarpments and varied habitats from plateau grasslands, savanna, thicket and semi-arid plains. 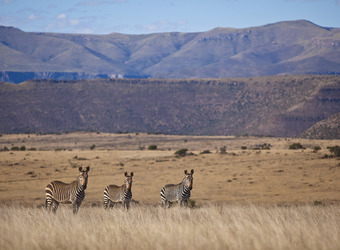 Rare species such as aardvark, Cape mountain zebra, cheetah and rhinoceros are frequently on view during open 4x4 vehicle drives and walking safaris. The arid western Karoo and Cambedoo National Park are dominated by a mountainous landscape with vast plains below. 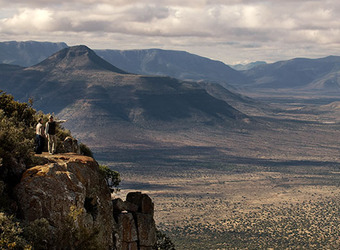 Four different biomes, including Nama-Karoo, plateau grassland, savanna, and thicket, are typically explored by safari vehicle or on foot with a naturalist guide. The scenery is evocative of East Africa’s great parks, and its open range is the perfect habitat for cheetah. Experience wildlife drives by open 4x4 safari vehicles in the early morning and late afternoon, and look for elusive aardvark after dusk by spotlight. Enjoy al fresco picnics at stunning overlooks, and guided walks between wildlife drives. Other activities on offer include planting a spekboom, a small-leaved succulent plant native to the area, visiting the local Khoisan rock paintings, and bird watching. 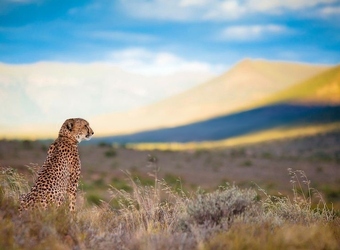 Cheetah conservation is a strong priority in the Great Karoo, and seeing cheetah by vehicle or on foot is a highlight. Samara Private Game Reserve reintroduced the first cheetah in the area after 125 years of local extinction due to widespread hunting in the 1800s. Now, a thriving population of cheetah is on view. This arid setting is also home to rare and unusual species such as Cape mountain zebra, black wildebeest and an abundance of aardvark. Noctural safaris conducted specifically to spot aardvark are a popular activity in the Karoo. Several colonies of meerkat reside in the region, as well as flocks of up to 200 endangered blue cranes during the winter months. Species that prefer semi-arid climates, such as gemsbok and springbok, are also found here, along with southern Africa's largest antelope, the eland, giraffe, brown hyena, white rhinoceros, red hartebeest, and many more varieties of plains mammals, carnivores and birds. The Great Karoo is so distinctive that it can complement a number of other regions. Samara Private Game Reserve features cheetah prominently while lion, leopard and elephant are not typically observed, so it's best to combine with the nearby Eastern Cape, which is a Big Five wildlife area, or with Kruger National Park, Sabi Sand Game Reserve or Madikwe Game Reserve. 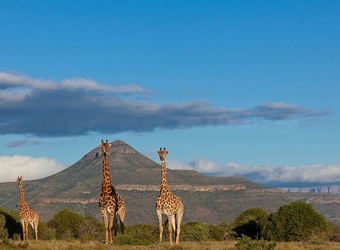 The Great Karoo is malaria-free, so one can combine it with other malaria-free regions such the Eastern Cape, Madikwe, the Southern Kalahari and Cape Town for a well-rounded family safari. When did you visit The Great Karoo?